Info "The kitty is tired. Push the button when its eyes close. Please attempt to succeed." Cat Nap is a microgame in the Reality folder in WarioWare, Inc.: Mega Microgame$!. The name is a pun on the phrase "catnap," which is used to describe a brief nap. The cat in this microgame also appears in the WarioWare: Twisted! souvenir, Pet Cat. A cat is in the middle of the screen, slowly closing its eyes. The player must press the button when the cat's eyes are closed fully to make it fall asleep. When the cat closes its eyes, half a second it will open them again, though. 1st level difficulty: The cat will close its eyes without faking out. 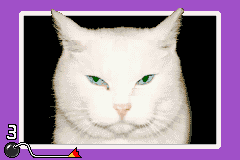 2nd level difficulty: The cat's eyes will stay halfway shut for a while before they actually close. 3rd level difficulty: The cat will blink quickly at the start, too quickly for the player to actually make it fall asleep, and then it will actually close its eyes. Additionally, the cat's eyes change color depending on the level, in Level 1 they are blue, in Level 2 they are yellow, and in Level 3 they are green. This page was last edited on October 31, 2018, at 07:07.